May 3 - June 8, 2001. This trip lasted 5 weeks and was 3,800 miles long. We traveled diagonally across Texas, and through the northeast corner of New Mexico, into Colorado. 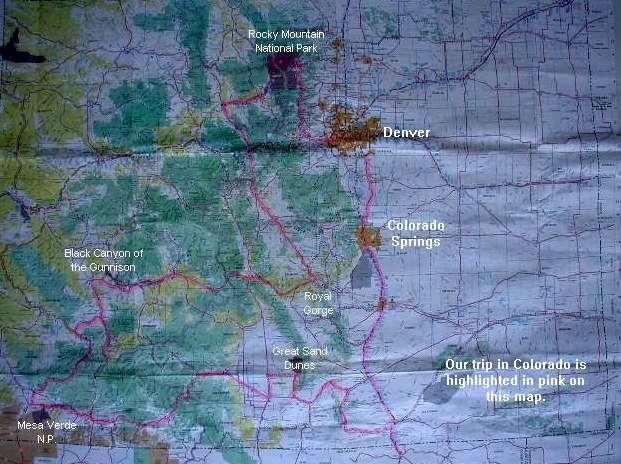 In Colorado, we zigged and zagged across the state from bottom-to- top. Then we returned home via Denver & Colorado Springs, stopping briefly in Odessa, Texas for a visit with Kay's mother. Statistics on the trip: We used 305 gallons of gasoline at a cost of $506. That gives a rate of 12.5 miles/gallon, mostly pulling the trailer through the mountains. The cheapest gas we bought was in Odessa & Austin, TX at $1.35. The most expensive gas was $1.85 in Salida, CO. We stayed in campgrounds 30 nights at a cost of $628, or $20.93 per night on average. 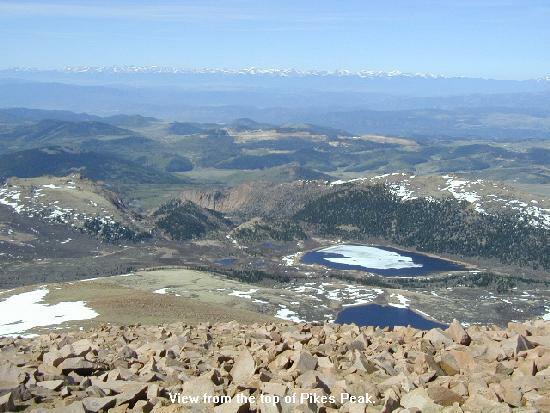 May is a very good time to visit Colorado. The weather is warm in the day and cool or cold at night and there are very few tourists! After Memorial Day, forget it! We left Richmond on Thursday morning, May 3rd, heading north on TX-36. [Map]. We traveled to Cameron, then US-77 to TX-7 & TX-317 to Crawford, the new Texas White House. 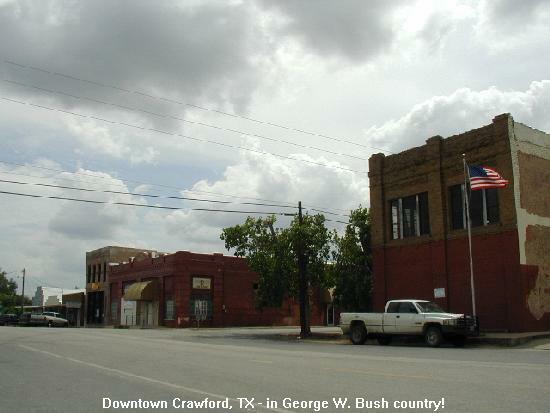 George W. Bush's ranch is about 7 miles northwest of town on Prairie Chapel Rd. We drove by but you don't get to see much except all the Secret Service folks had set up camp at the entrance gate. Afterwards we drove up TX-36 to Comanche and TX-16 to Promontory Park (an Army Corps park) on Proctor Lake and spent our first night. The next morning we continued up TX-36 to Abilene. Then I-20 west to US-84, and north to Lubbock, where we stayed at Buffalo Springs Lake. It was a surprising change from the flat high plains of Lubbock. Buffalo Springs Lake is a spring-fed lake in Yellowhouse Canyon on one of the forks of the Brazos River. On Saturday, May 5th we left Lubbock on I-27 north. 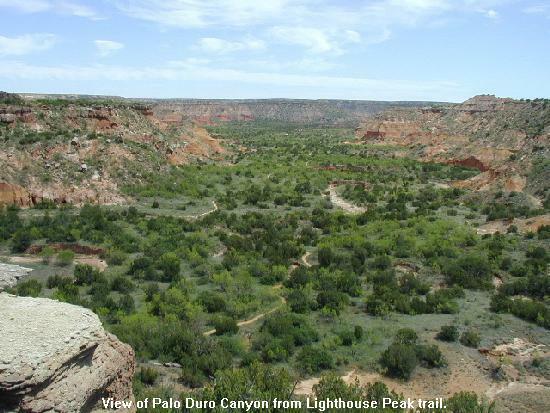 At TX-217, we went east to Palo Duro Canyon State Park, where we spent Saturday & Sunday nights. 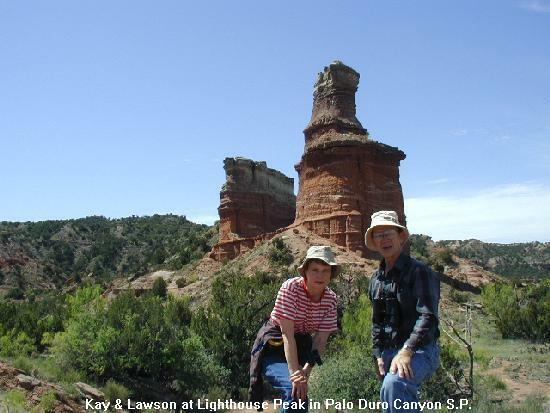 Palo Duro Canyon is labeled as the "Grand Canyon of Texas" and is the 4th largest Texas park. The canyon is 120 miles long and 800 feet deep and is the 2nd largest canyon in the U.S. We hiked along several of the trails, including the Lighthouse Trail (a 6-mile round trip!). Temperature in the day was about 80F and about 45F at night. Monday, May 7th, we left Palo Duro via TX-217, US-60, US-385, US-87 & I-25 to Trinidad, CO. We saw many herds of antelope in the large ranch pastures to the side of US-87 just east of Raton, NM. After going through the Raton Pass (7,834 ft), we stayed at the Summit RV Park in Trinidad. 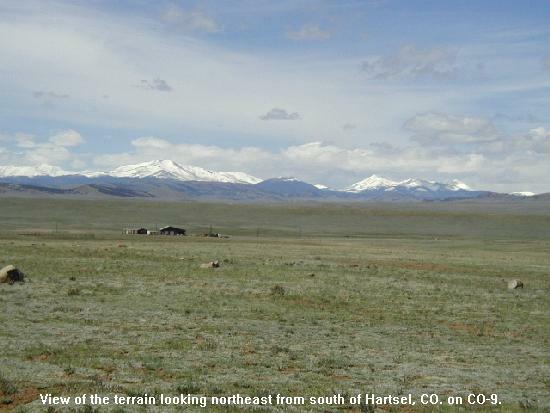 The tops of the Sangre de Cristo Mountains to the west were white with snow. The next day we moved the trailer to Trinidad Lake State Park on CO-12. 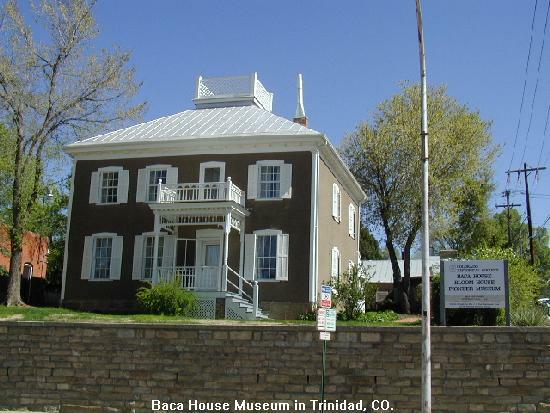 We went back into town and toured the Santa Fe Trail Museum and the Baca House, an 1870 adobe home that blends Hispanic art with Victorian furniture. We also walked through the historic downtown area. We plan to tour the Bloom Mansion as we return home, since it was closed for repairs. 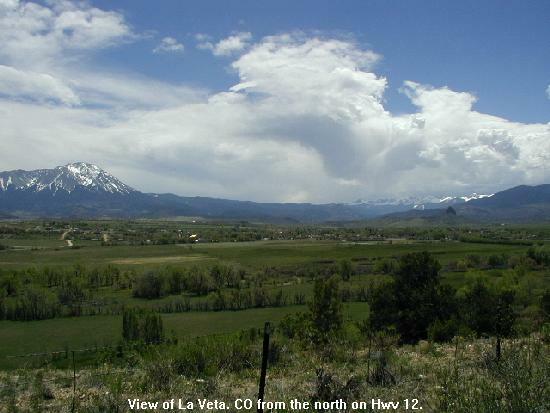 On May 9th, we drove up CO-12 to La Veta. This highway is called "The Scenic Highway of Legends". 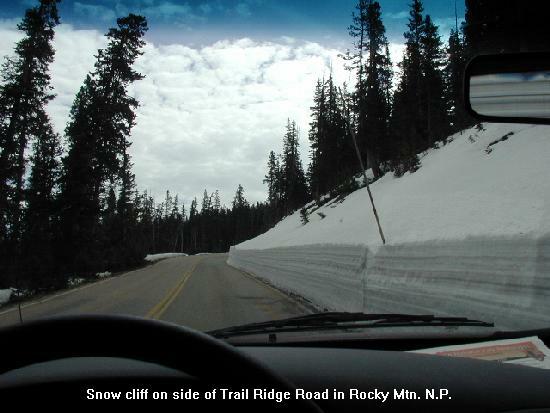 The road follows along east of the Sangre de Cristo Mts. We stopped at Monument Lake and several small towns. We passed through Cuchara Pass (9,994 ft) at the midway point. Just north of La Veta we took US-160 west through North La Veta Pass (9412 ft) to CO-150, then north to the Great Sand Dunes National Monument. We stayed at the G.S.D. 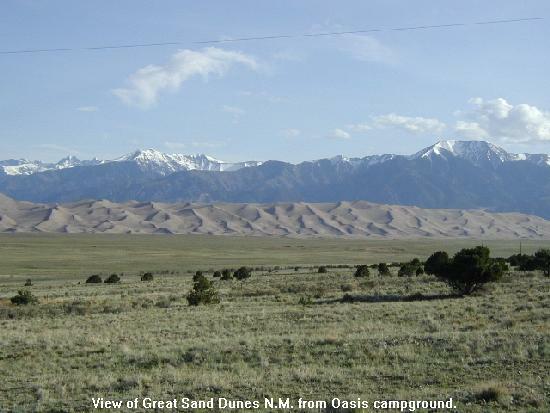 Oasis campground just outside the park entrance, with a very good view of the sand dunes and surrounding mountains. We saw many mule deer and other wildlife. 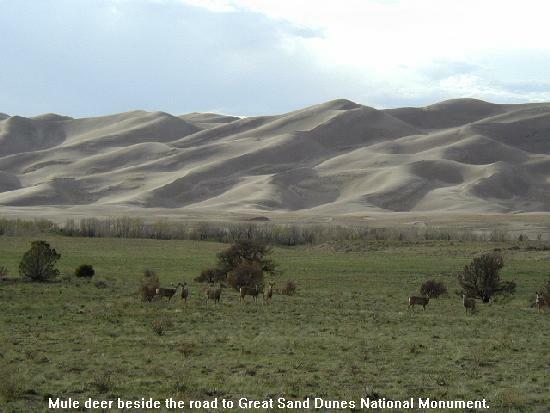 The next morning we drove over to the sand dunes. We waded through Medano Creek and walked up some of the dunes. 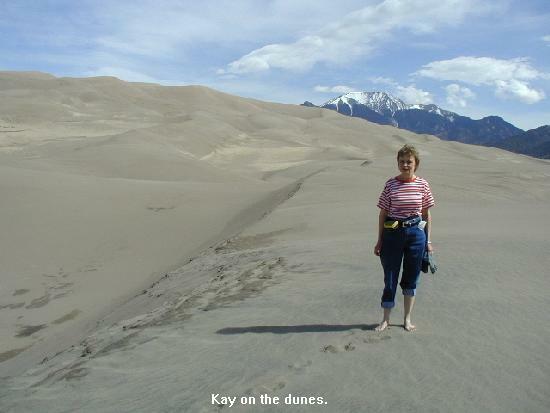 The dunes cover 39 sq. miles and are nearly 750 ft high. 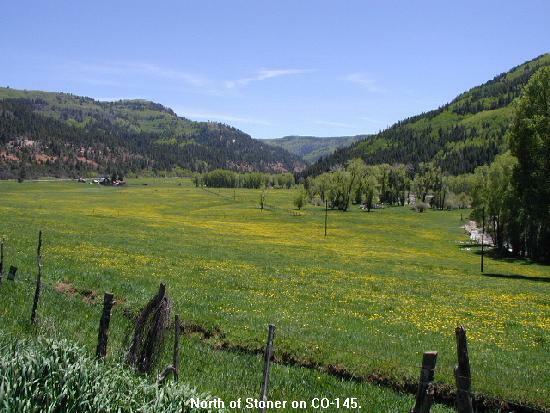 After lunch, we left for Pagosa Springs via Six Mile Lane, CO-17 & US-160. 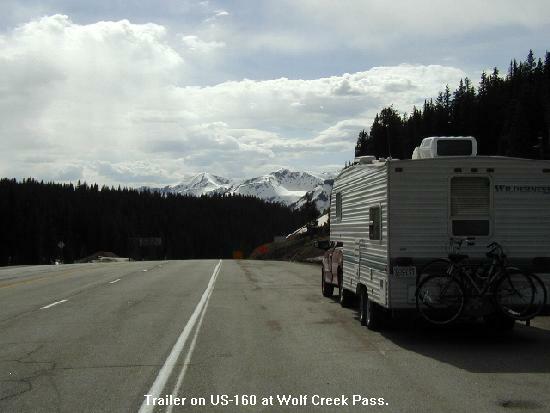 Just east of Pagosa Springs, we crossed the Continental Divide at Wolf Creek Pass (10,860 ft). East of the pass, we had to wait about 30 minutes while road crews blasted and hauled away boulders from the side of the road. They close US-160 from 7PM to 7AM this time of year. West of the Pass, we stopped to see Treasure Falls. 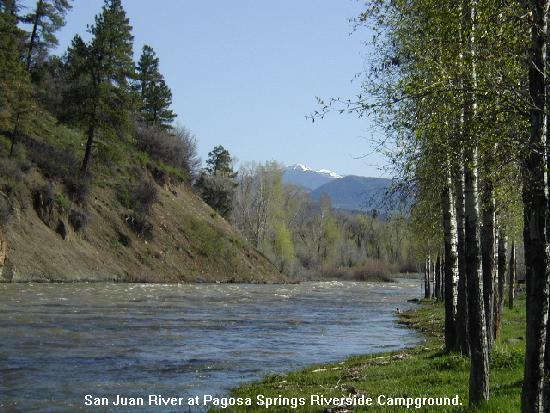 In Pagosa Springs we stayed at Pagosa Riverside Campground. On Friday morning May 11th, we looked around the downtown and saw the source for the hot springs that Pagosa is named for. They are the hottest springs in the world (154F). We also toured the Fred Harman Western Art Museum. Fred's son (Fred, Jr.) gave us a tour of this very interesting museum. 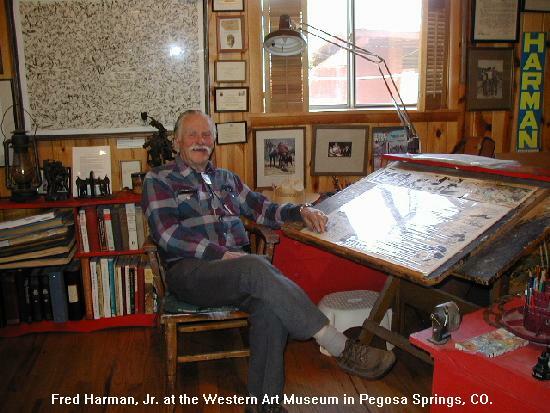 Fred Harman is famous for drawing the "Red Ryder" comic strip and in his later years, western style paintings. He and Walt Disney began their careers as commercial artists in Kansas City in 1921. That afternoon we drove west on US-160 to Durango. On the way we could see the Chimney Rock formations to the south side of the highway. 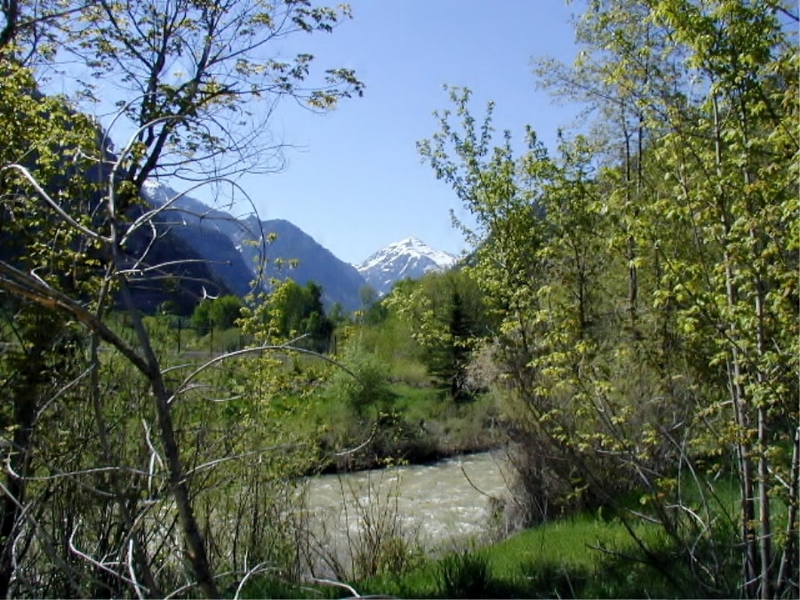 In Durango, we stayed at Cottonwood Camper Park on Lightner Creek, just where it meets the Animas River. 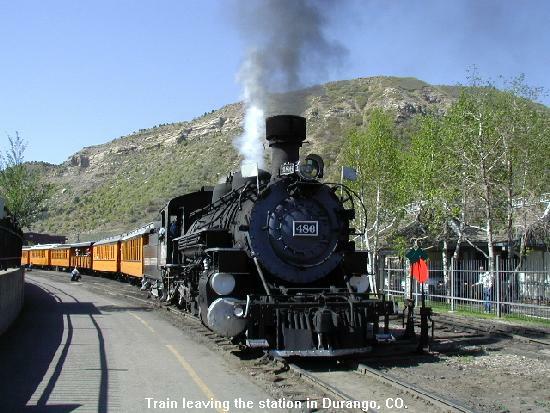 Saturday, we walked from the campground over to the Durango & Silverton Narrow Gage Railroad Museum and toured it and the depot. We watched a chartered train leave the station. We decided not to ride the train this time. In the afternoon, we drove about 10 miles north to Honeyville and saw a working display beehive in the store and bought some honey. Later in the afternoon, we toured the Animas Museum, located in a 1905 restored restored sandstone schoolhouse. 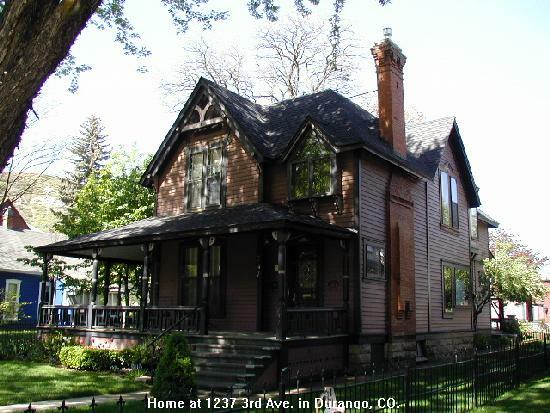 Sunday, May 13th, we drove to the Historic District of Durango and took the walking tour of Third Avenue historic homes, which date from the 1880's. We then took the walking tour of Main Avenue, the historic business district, the highlight which was the Statler Hotel which opened in 1888. After lunch, we drove west on US-160 to Mesa Verde National Park and settled into the Morefield Campground at around 8000 ft elevation. Monday we drove to the visitor's center and purchased tickets for ranger tours of the Cliff House and the Balcony House. These hikes included climbing ladders, squeezing through cracks in giant rocks, and crawling through a tunnel. After the tours, we drove around a scenic loop and viewed Square Tower House (not open for tours). Then we went through the Park Museum and hiked down to the Spruce Tree House. Afterwards, we went back to the trailer, stopping along the way to observe the scenery. One of the stops was North Rim Overlook. 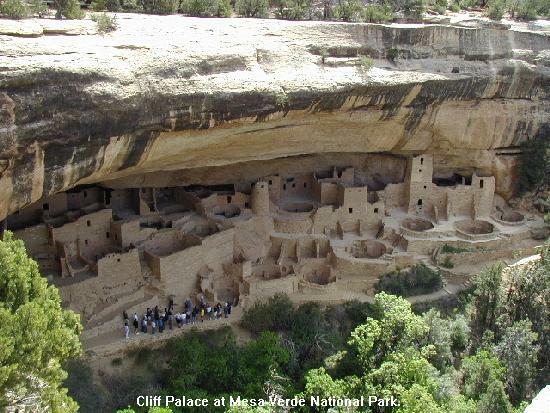 Tuesday we drove out of Mesa Verde N.P. west on US-160 to Cortez. 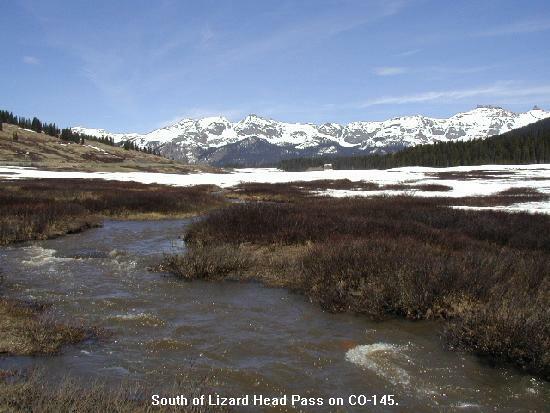 At Cortez, we took CO-145 through Lizard Head Pass (10,222 ft) to Placerville & CO-62 through the Dallas Divide (8,870 ft) to Ridgway, then US-550 south to Ouray. At Ouray, we stayed at the Ouray KOA. 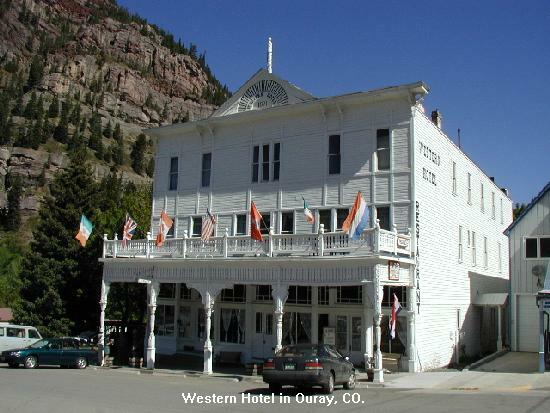 Wednesday the 16th, in the morning we took the walking tour of the historic district of Ouray, dating from the 1880s. In the afternoon, we hiked up to Cascade Falls, which was NE of downtown. Afterwards we spent the rest of the afternoon at the Ouray County Museum. It was built in 1887 as a hospital, and served the town until 1964. In addition are two log cabins stocked with 1880s period furnishings. 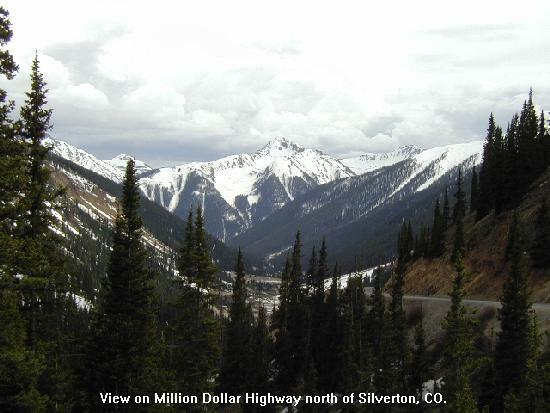 Thursday, May 17th, we took US-550 south from Ouray to Silverton. 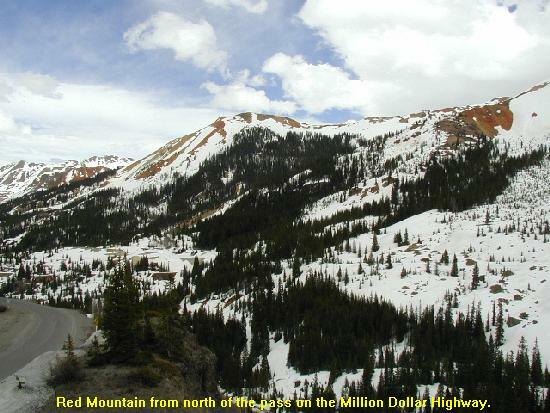 This road is called the "Million Dollar Highway" and passes over Red Mountain Pass at 10, 910 ft. The views of Red Mountain are spectacular, and the road is breathtaking! 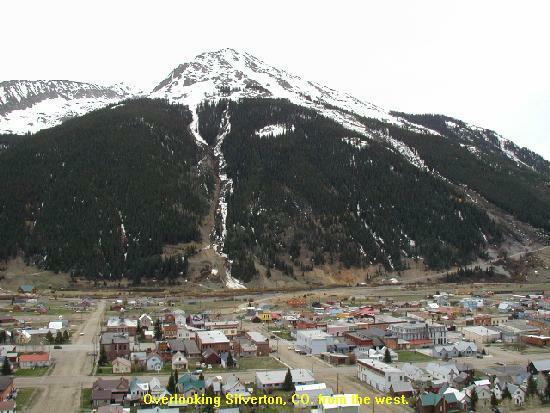 In Silverton, we saw the other end of the Durango & Silverton Narrow Gage Railroad. We took a walking tour of downtown, and took a tour of the Old Hundred Silver Mine. It's 47F inside the mine, winter or summer, and quite wet from the melting snow that seeps through the rocks from the mountain above. In the afternoon, we returned to Ouray via US-550 again. 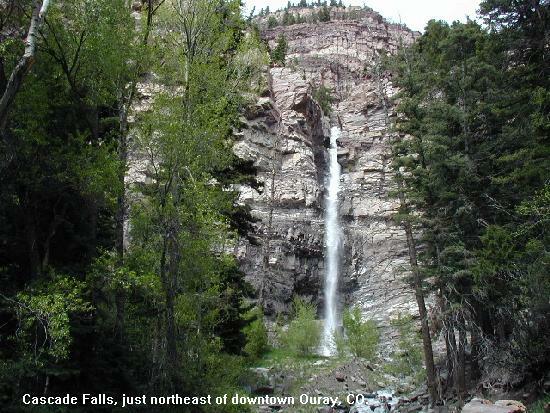 On Friday morning, we made a quick trip to Ouray and then headed up US-550 toward Montrose. 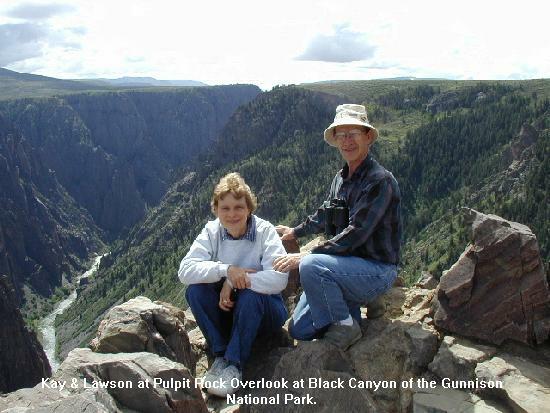 At Montrose, we took US-50 to Black Canyon of the Gunnison National Park. We stayed in the park campground, which was our first dry camping of the trip. That afternoon, we hiked from the campground to the visitors center, along the rim of the canyon. Saturday morning, we drove around the south rim road and stopped at several of the overview sites. 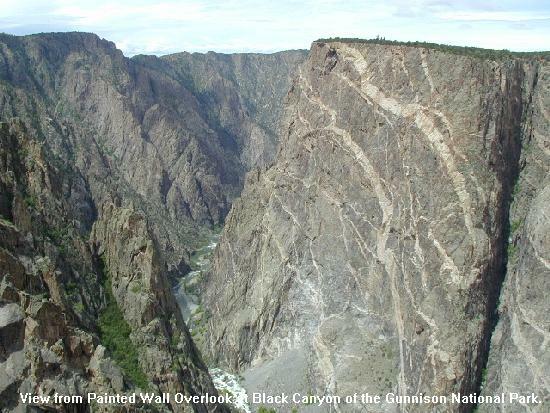 At the Painted Wall Overlook, the shear cliff face is the highest cliff in Colorado, and to put it in perspective, it is almost twice as tall as the Empire State Building! In the afternoon, we traveled east on US-50 to Gunnison, where we spent the night at the KOA. 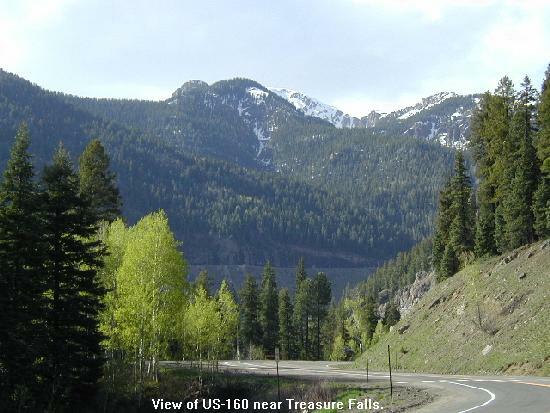 Sunday, May 20th, we continued east on US-50, passing over Monarch Pass (11,312 ft), crossing back to the eastern side of the Continental Divide, and ended up at the Royal Gorge KOA where we spent the night. Monday morning we woke up to find an inch of fresh snow on our campsite. It got down to 35F that night, so it began to melt immediately. 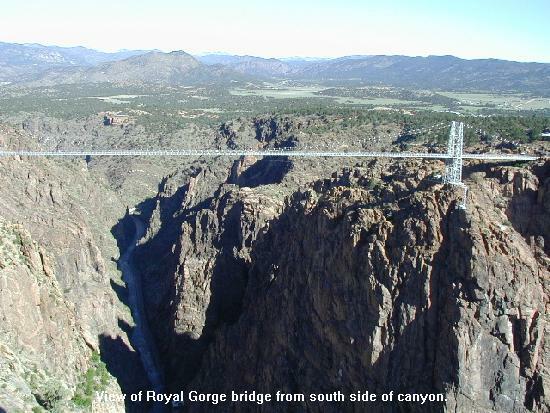 We went down to the Royal Gorge and walked over the bridge that spans the gorge. It is claimed to be the world's highest suspension bridge. 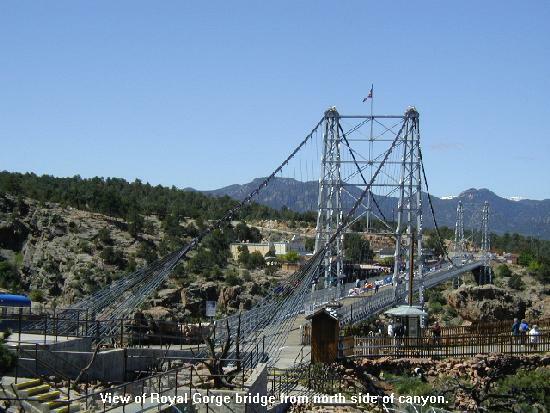 Built in 1929, it is 1,053 ft. above the Arkansas River. It is 1,260 ft. long. We took a ride on their incline railroad from the rim to the river. 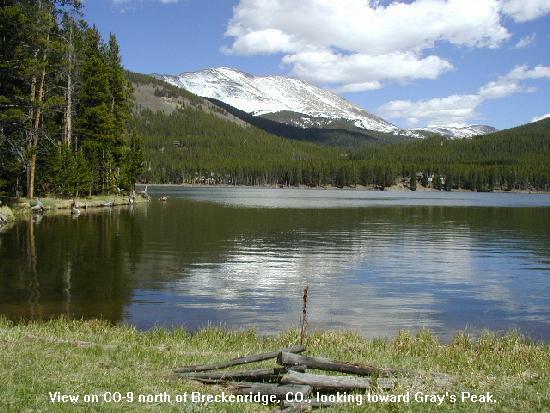 After lunch, we went west on US-50 to CO-9, then north to Fairplay (9,896 ft). Along the way we saw several pastures of buffalo among the picturesque snow covered mountains. Tuesday morning we toured the South Park City Museum in Fairplay. 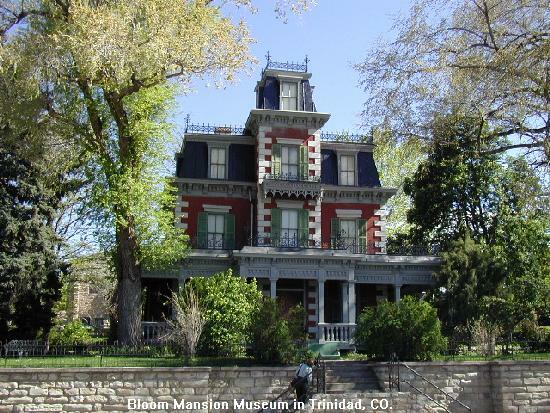 The museum is a collection of over 40 old buildings from all around Colorado, setup as a 1880s era mining town and containing over 50,000 historic objects. This is a very good museum and a surprise to find in a town of only 450 people. In the afternoon, we continued north on CO-9 over Hoosier Pass (11,541 ft), crossing back over to the western side of the Continental Divide and on to Kremmling. 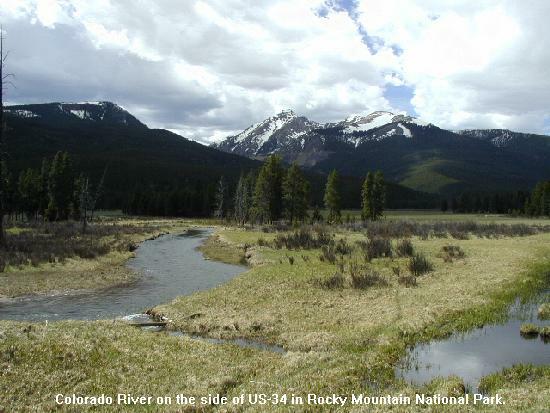 Wednesday, May 23rd, we traveled east on US-40, then north on US-34 to Grand Lake, just outside the western entrance to Rocky Mountain National Park. 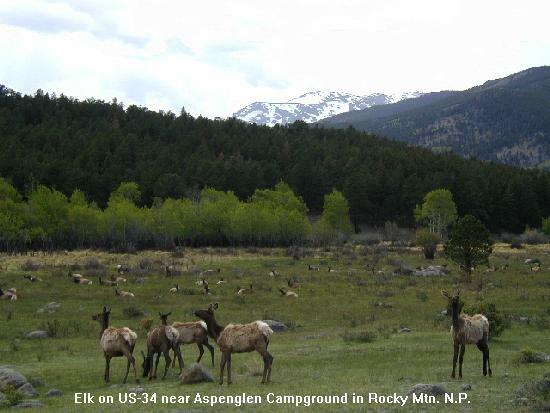 In the afternoon, we drove into the park and saw several herds of elk grazing in the Kawuneeche Valley next to the Colorado River. We took a hiking trail to Never Summer Ranch, a rustic tourist complex created in the 1920's. 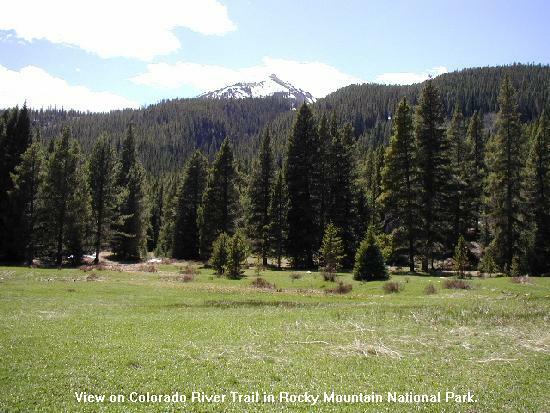 Next day, we pulled the trailer into Rocky Mountain National Park and camped in the Timber Creek Campground. After lunch, we hiked the Colorado River Trail and the Red Mountain Trail. Later, we explored the Colorado River next to our campground. 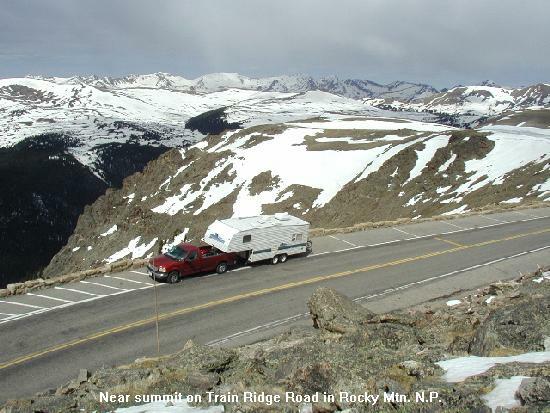 On Friday morning we continued up US-34 east, over Milner Pass (10,758 ft) and on Trail Ridge Road (the highest continuous road in the United States), which was first opened for the season this morning, over Fall River Pass and on down the other side to Aspenglen Campground. In the afternoon we drove into Estes Park on US-34. For our return to the campground, we took US-36 from Estes Park. We saw mountain sheep, elk, coyotes, and assorted other wildlife in abundance along the road. 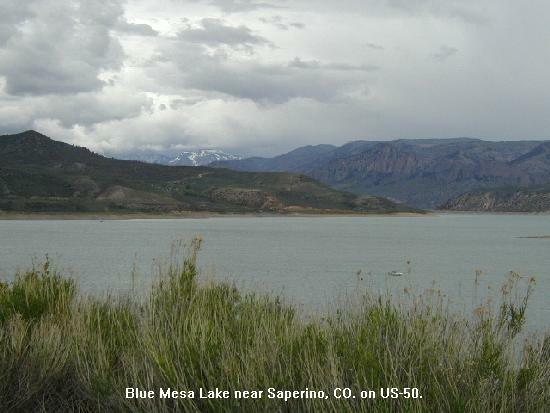 Saturday we drove west on US-34, south on US-36, the south on Bear Lake Road to Bear Lake. 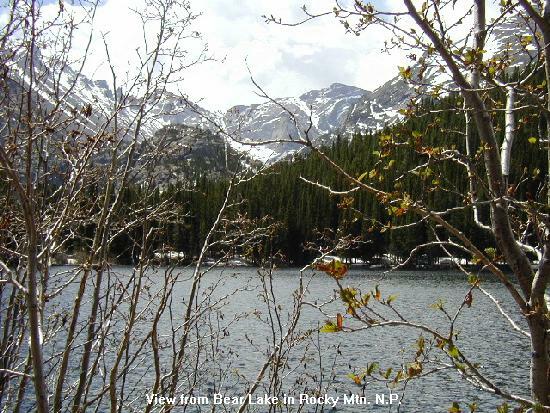 At Bear Lake, we hiked the trail around the lake. 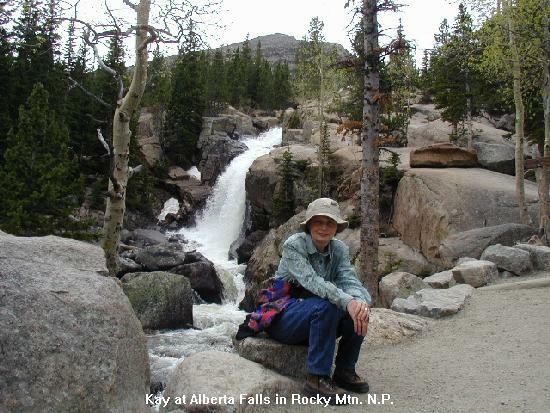 Then we hiked the trail to Alberta Falls, where we ate our picnic lunch. Afterwards the weather began to close in on us. 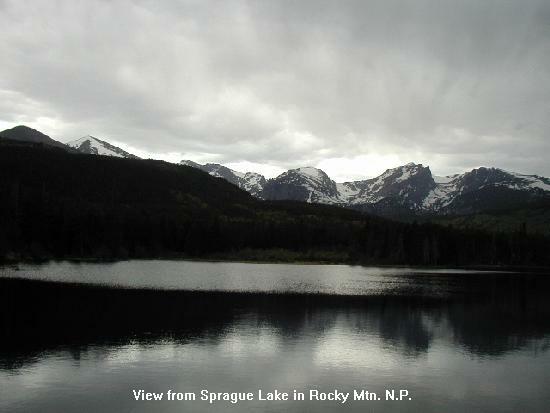 We went back up Bear Lake Rd to Sprague Lake and hiked the trail around the lake before the rain set in. We then continued up to Moraine Park Museum and toured the exhibits. Sunday morning we hiked from the campground along the Deer Mountain trail and got a good view of our campground valley and Deer Mountain. Around noon, we pulled the trailer into Estes Park and parked at the KOA. Since we had been "dry camping" for the past three days, we needed hookups for a while. 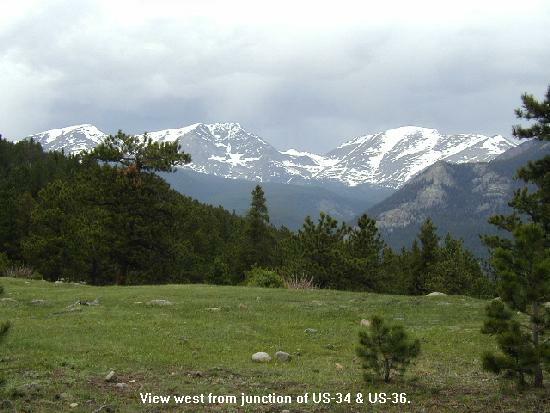 Monday, May 28th, we left Estes Park via CO-7 south, then CO-72 & CO-119 to I-70. Then we went east to Denver, where we parked our rig in the driveway of a friends house. On Tuesday, we caught The Ride (Denver bus) to downtown Denver. Before lunch we toured the Denver Mint. 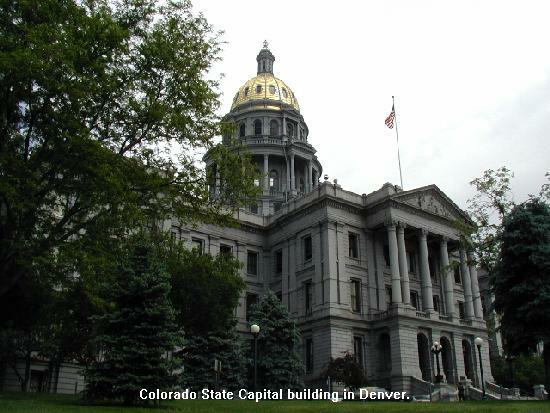 After lunch we toured the Colorado State Capital (1908) building. 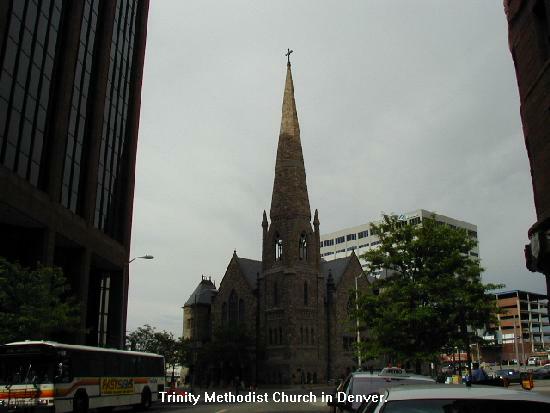 Afterwards, we toured the Molly Brown House (1889) Museum and the Trinity United Methodist Church (1888). We then walked down the 16th Street Mall to meet the bus, which we rode back home. Wednesday, we took CO-83 south from Denver to Colorado Springs. We stopped at the old Ford FMI building in the northern part of Colo. Spgs., which is now an Intel design center. We continued on I-25 to US-24 west, and then to Fountain Creek RV Park. Thursday, in the morning we went to the Cheyenne Mountain Operations Center, the home of NORAD. They no longer give tours of the site, but they do have a multi-media presentation that explains base operations. We viewed that presentation. Afterwards, we went up I-25 to the north side of Colorado Springs and toured the Focus on the Family headquarters complex. We saw the broadcast studio for Dr. James Dobson's radio program. 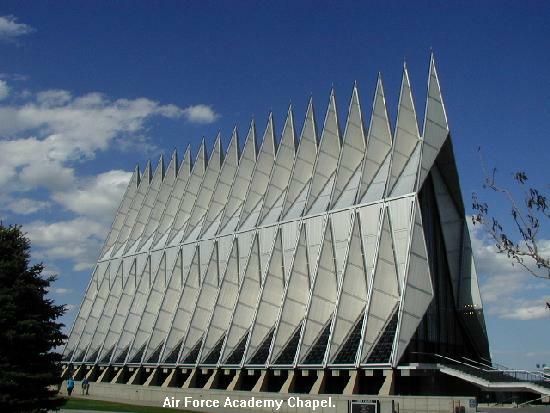 Later in the afternoon, we drove across I-25 to the Air Force Academy campus. We toured the visitors center, the Academy Chapel and Arnold Hall, the cadet social center. Not many cadets were around today - graduation had taken place the day before. 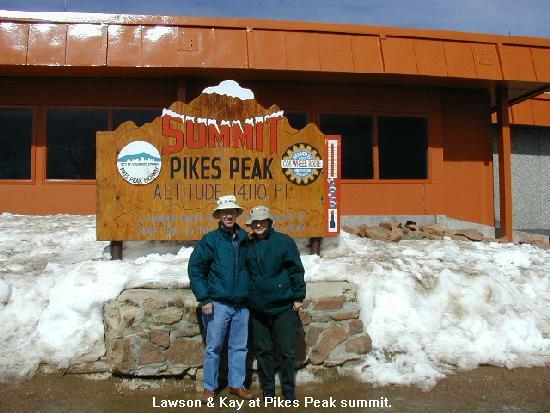 Friday, June 1st, we drove to Manitou Springs and caught the 8AM Cog Railroad train to the top of Pikes Peak (14,110 ft). 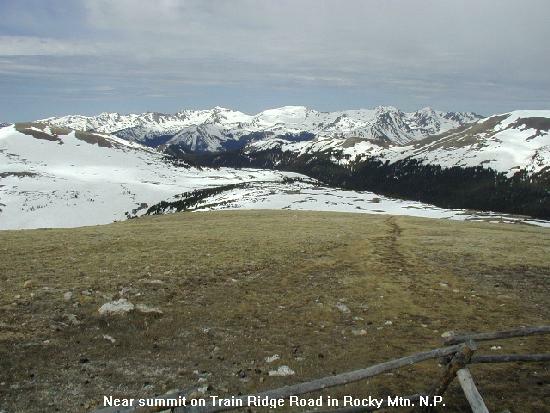 At the top, you get a great view of all the snow covered mountains of the Continental Divide. The trip takes about 1-1/2 hours one way, and there is 45 minutes at the top. In the afternoon, we toured Miramont Castle Museum in Manitou Springs. 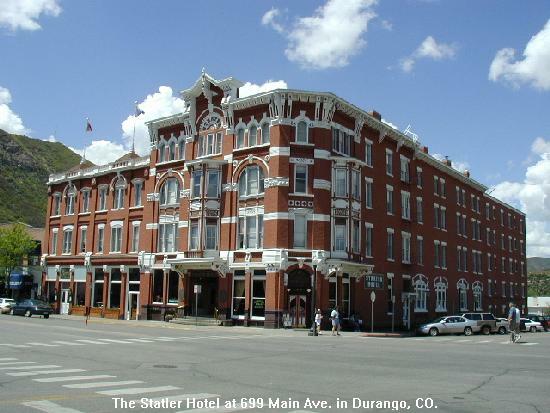 It is a circa 1895 building, featuring nine styles of architecture, crafted from locally quarried greenstone and yellow pine framing. 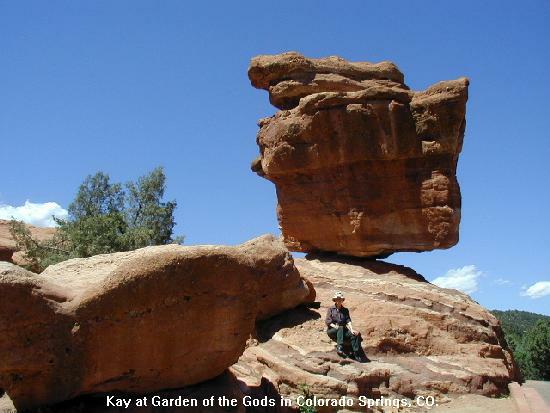 In the late afternoon, we visited the Gardens of the Gods park in Colorado Springs and watched many rock climbers attempting the spectacular rock formations. Saturday, we left Colorado Springs on I-25 south. We stopped in Trinidad to use our rain check to tour the Bloom Mansion Museum. We continued on I-25 over the Raton Pass (7,834 ft), then on US-87 to Clayton, NM. We saw many herds of antelope along the highway west of Clayton. We stayed at the Meadowlark KOA. Sunday, we continued east on US-87 to US-385, then south to Odessa, TX. We spent Monday & Tuesday with Kay's mother, then took I-20 east to TX-158. At Sterling City, we took US-87 to Brady, then TX-71 to Llano, where we spent the night at the VFW campground. Thursday, we continued east on TX-71 to US-ALT90, then home to Richmond. This draws to a close our Colorado Tour. We hope you enjoyed the pictures and brief descriptions of our adventures. God willing, join us again for another adventure later this year.